Nice scarf. Happy with my purchase! 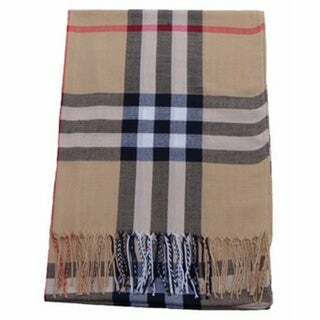 Wrap this beige plaid scarf around your neck to dress up an outfit while staying warm. Inspired by Burberry, this scarf has a refined look with fringed edges adding a decorative touch. Super Nice for a great price!!! I love this scraf!!! It is made very well and is very nice quality! If you are looking for this look then this is really close to the real thing without breaking the bank!!!! Nice scarf. Even though the scarf is polyester it is a great scarf. I love how lightweight and soft this scarf is but it is so warm!! I have gotten so many compliments and it looks like a much more expensive piece. This is a beautiful scarf, it’s soft and silky on your skin. It looks so nice with just everything I wear it with. Have had many complements on it. A lot of people, think it’s very popular brand of scarf. I’m thrilled with my purchase. This scarf is of great quality and loved by my granddaughter at college. Delightful scarf! Very chic and can’t wait to wear this fall. Scarf is ok. It is a little larger than I expected. Looks as pictured, it is a little bigger than i thought but thin enough to wrap. I have not used it yet as weather is still warm. Mega compliments. Very iconic. Great quality at a minimal price. Feels and looks like high quality cashmere, feels great on the skin, the colors are vibrant and the v length is just right. Very good value from overstock. "Is this an authentic scarf? If yes why is so cheap $"
"Is the scarf authentic ? " This purchase will include an authentic scarf. It’s not a Burberry. But, it’s really is a nice scarf for the price. I love the softness, plus it’s very pretty. I find the length of the scarf perfect. I’m planning on using it this fall and winter. "I cannot find the dimensions..."
This scarf measures approximately 26 inches x 68 inches. I agree 26” x 68”. A very nice size for adding to your fall sweaters and coats to make your outfits that pop of color and in fashion styles this season. Hope this helps you. Enjoy!